It'll probably go down as the most unusual water rescue of the season. Cries for help were heard coming from the Rehoboth Bay about 100 yards west of the Rusty Rudder dock early Saturday. Jason Kilner from Olney, Maryland, says he was on the Rudder dock when he heard "something in the water screaming help, help" around 12:40 a.m. He said "I'm kind of like, is this real?" He went to the edge of the dock and heard a woman in the water yelling. "So I drop my pants, my shirt, everything, and I dove out and I grab her," Kilner said. "But when I grab her it's [only] four foot of water." He says she was misleading him about needing assistance. "For 30 minutes," Kilner says, "I tried to get her to tell me where she came from and what her deal was... All I got from her was that her name was Rachel." Kilner says he tried to coax her to safety and even agreed to race her to a boat on the Rudder dock in an attempt to get her to safety. But that was when "I start going in, she goes out." Kilner says. He said he suspected she must be on drugs. At some point, he said "She took her dress off, threw it behind her… So her dress is sitting on the piling over there…. She's naked in the water." He left her in the bay, returned to the dock, put his clothing back on and returned to the Rudder's bar to tell his friends, the bartender, and ultimately, police officers who are outside the restaurant. Police went out on the dock and Kilner says the officers "see this chick doing this and she's crying again just like she was when I went out and grabbed her." Officers radioed for assistance and alerted Rehoboth, Bethany and Indian River firefighters and county paramedics. Meanwhile, two Dewey Beach officers and an off-duty firefighter obtained life vests and a rescue ring from a docked vessel. Fearing that the tide was pulling her farther from the dock, they entered the water to search for her. They were concerned about her mental and physical state. 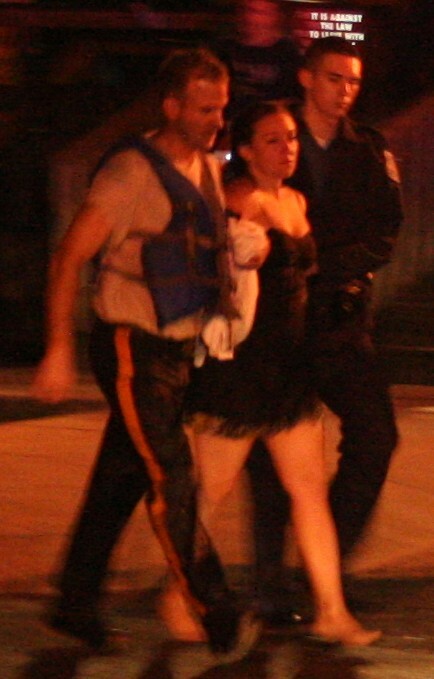 Officers finally find her about 250 yards from the dock in approximately eight feet of water. She was drifting west. She continued crying and refused to come with the officers. After negotiating with her for about 10 minutes police say they were able to secure her in the rescue ring. She was brought back to the dock where they were met by a Bethany Beach rescue vessel. Sgt. Clifford Dempsey says he swam about 300 yards each way, and against the tide on the way back. Using a docked vessel as a platform to remove her from the water, she was assisted out by a county paramedic. While EMS personnel conducted an exam of her on the vessel, Sgt. Dempsey says she became combative and assaulted the paramedic. She was handcuffed and rescuers walked her off the dock to the waiting ambulance. In the ambulance she continued to be combative. Several minutes later, police decided to take her to Beebe Hospital using the department's van. The woman was later identified as 30-year-old Rachel Decenzi of Media, Pennsylvania. She has been charged with offensive touching of medical personnel, disorderly conduct and resisting arrest. Sgt. Dempsey issued this news release on Saturday. Here's must-watch YouTube video of the scene including an interview with Jason Kilner, the man who discovered the woman, and more scene video from Jim Davis. 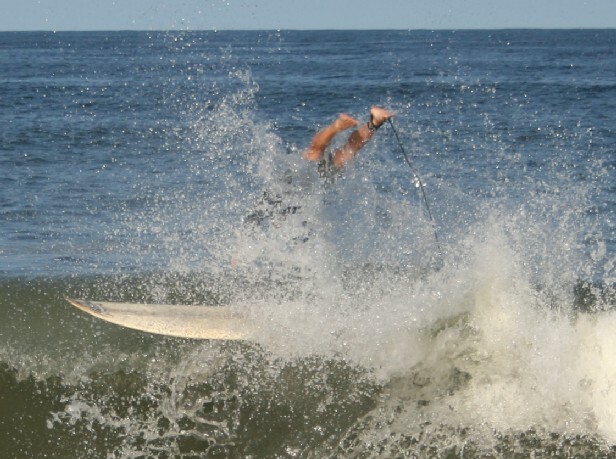 The waves were large, the surfing was good and weather was lovely Saturday afternoon in Rehoboth Beach. 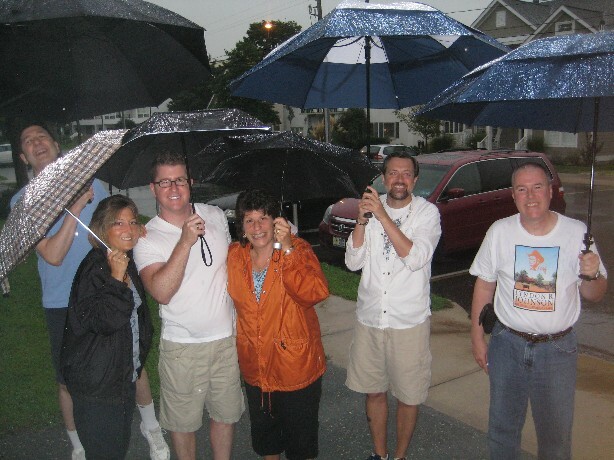 Saturday evening did bring more rain, but did not stop the guests at Rehoboth's Lighthouse Inn Bed & Breakfast from getting outside. 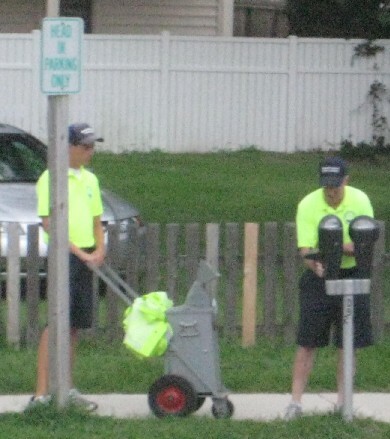 * Ocean City requires parking permits for residential parking on eight streets in the Caine Keys section. The streets are: Winter Harbor Drive, Channel Buoy Road, Point Lookout Road, Shifting Sands Drive, Old Wharf Road, Old Landing Road, Pine Needle Road and 112th Street. 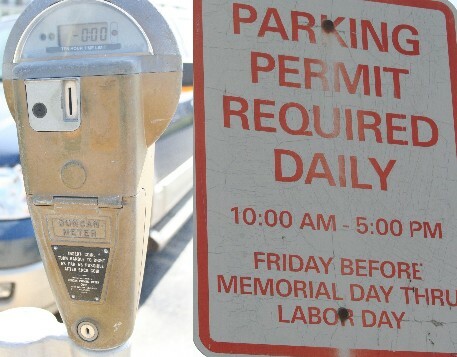 No permits are required for public parking elsewhere in town. Rehoboth Beach Commissioner Stan Mills and his wife, Marcia Maldeis, are avid butterfly gardeners and have photographed this fascinating transformation of a Monarch caterpillar as it matures into a butterfly. All this was done from the garden in their yard. For more details on how to start a butterfly garden, try this Website or the Butterfly Gardening e-mail list on Yahoo. 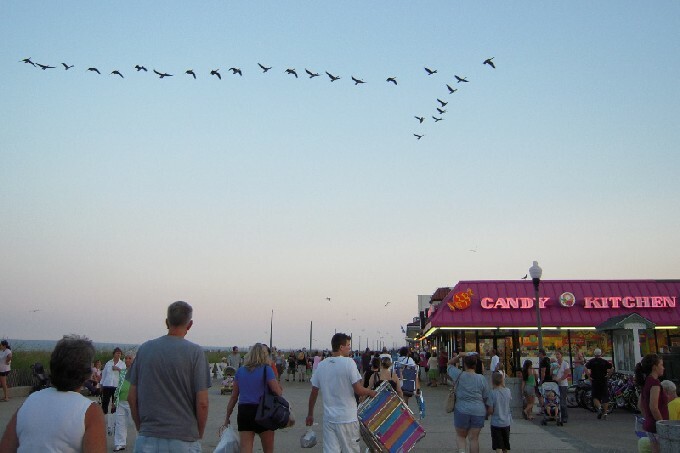 Just why are so many Canada Geese flying north over Rehoboth Beach these days? Experts on the Yahoo Groups GooseTracks speculate that these are the non-migratory birds and/or the weather to the south is not as favorable as it is farther north. HENLOPEN WINDOW BROKEN BY SLING SHOT--- A window on the sixth floor of the Henlopen Condo was reported discovered broken out around 2:20 p.m. Monday. The initial report was that it had been shot out. But Rehoboth Beach Det. Kevin Jones says the incident apparently involved a sling shot and a ball bearing. No gun was involved. MAN GETS ARRESTED TWICE IN 2-HOUR PERIOD--- Rehoboth Beach police quickly nabbed a drunken man driving a Mercedes with no headlights on after receiving a tip early Sunday. The man had just left the area of the Aqua Grill and was found one minute later driving toward the boardwalk in the first block of Baltimore Avenue around 12:10 a.m.
Det. Kevin Jones conducted a field sobriety test on the man and arrested him for DUI. After processing the man, Det. Jones drove him back to his room at the Econolodge. About 10 minutes later, Det. Jones said over the radio that he was placing the man under arrest once again, and was returning to the police station. He did not say over the radio what the second arrest was for. UNKNOWN INTOXICATED MAN FOUND ON BACK PORCH--- An intoxicated 23-year-old man was found sleeping on the back porch of an ocean-front house on Hazlett Avenue in Indian Beach, south of Dewey around 6:45 p.m. Sunday. When he came to, he told a paramedic that he had been drinking a lot and they did report that he smelled of alcohol. He was taken by ambulance to Beebe Hospital. 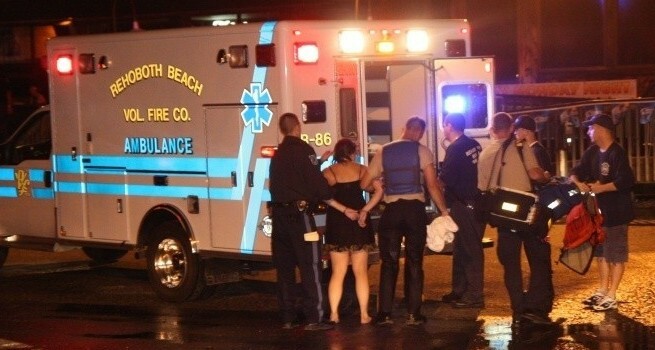 Dewey Beach had a similar incident this weekend as well. No word on charges, if any. REHOBOTH BEACH BURGLARY--- A resident in the ocean block of Brooklyn Avenue awoke to find a black male juvenile inside of the residence just before 6 a.m. on Thursday. While inside, Det. Kevin Jones says the suspect stole a wallet and several cell phones, including one next to the sleeping occupant! The suspect fled on a bicycle north on the boardwalk. There was a slight delay in notifying the police since all of the cell phones were stolen, Det. Jones added. The suspect was found to have entered through an unlocked window by climbing on top of a trashcan. Evidence recovered at the scene is being analyzed in hopes of identifying a suspect. This was the only report of this type filed with the RBPD. 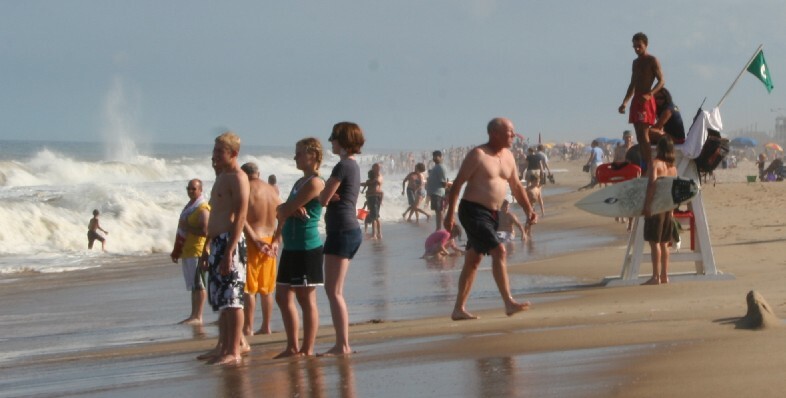 Check the Rehoboth Beach NEIGHBORHOOD WATCH Website. EARLY MORNING O.C. FIRE ALARMS--- Ocean City firefighters responded to three early morning fire alarms since Friday. Around 1:25 a.m. Friday they were sent to the Plim Plaza Hotel on 2nd Street for an odor that smelled like burning tire in the Mug & Mallet restaurant. Nothing was found. Two hours later, firefighters responded to the New Phoenix Atlantic Condo on 93rd Street. An audible alarm was sounding and the building was being evacuated. There was no apparent reason for the activation which was traced to a second-floor smoke detector. They said the same detector had trouble a couple weeks ago. Another smoke detector activated in the restroom of the Grand Resort Ware shop inside the Stowaway Grand Hotel on 21st Street around 12:20 a.m. Saturday. They said it appeared to be a malfunctioning detector. Friday 3:05 p.m. - In front of the Roadhouse Steak Joint between Lewes and Rehoboth. One minor injury was reported. Friday 7:15 p.m. - Southbound near Argos Corner Road west of Slaughter Beach. A 45-year-old woman was injured, described as not alert, and taken to the hospital. Saturday 2:25 p.m. - In the parking lot of the Rehoboth Kmart off Coastal Highway. Fluid and debris were reported on the roadway. Everybody involved declined to take an ambulance to the hospital. 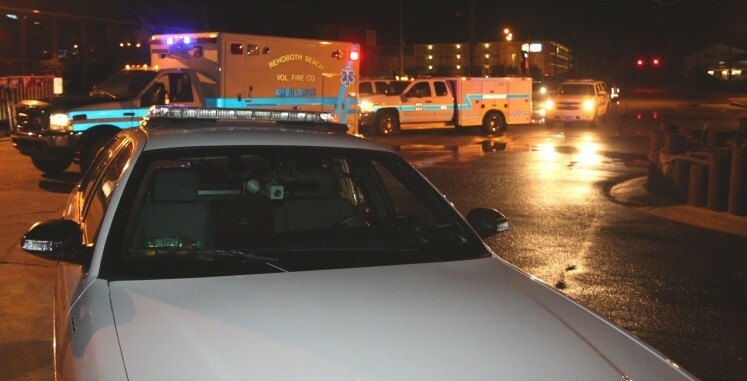 Sunday 3:30 a.m. - At 48th Street in Ocean City a woman was struck after she stepped in front of a taxicab. She was reported having shallow breathing and was taken to Peninsula Regional Medical Center. Sunday 1 p.m. - Two vehicles were involved in a crash in the southbound lanes in front of the Rehoboth PNC Bank. Nobody took an ambulance to the hospital. Listen for the “Henney Report” on 92.7/WGMD-FM's Monday morning show with Dan Gaffney!